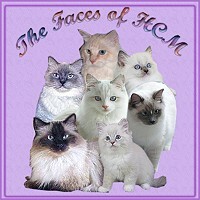 Would you like to link to RagdollResearch.org and help get the word out about HCM? Please feel free to pick up our linking banner at the bottom of this page, thank you! Would you like to link to us? Please "right click and *save as* to your hard drive, then upload to your server into your images folder or where you upload your images to. Link it to http://ragdollresearch.org, thank you! Remember to change the name of the directory and image name to reflect yours. If you don't have a folder for your images just remove * images/ * Any problems please feel free to contact us.